I had no idea who the Zee Brothers were or anything about this comic before reading it. 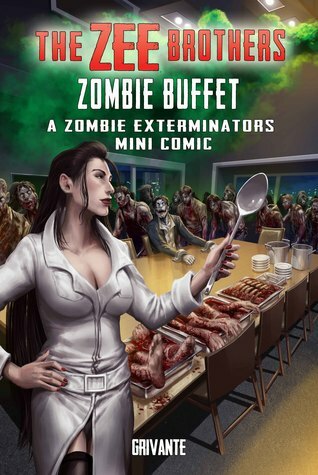 And after reading it, I don’t think I learned anything either.It’s a very short story about an experiment where a guy is turned into a Zombie and then fed as many female corpses as he could eat, I thought it weird that every corpse they showed him eating was female. Anyway, it comes to no surprising end. And that is it.Not much in detail about who these characters are or anything. Just their name and what they are doing in this mini-comic. I wasn’t impressed.Be forewarned that this comic is very graphic in a blood and guts way.Happily, it is DRM Free. I'd like to see where this goes.Apparently I'm really interested in some of the other details in this mini comic. My mind was occupied with a lot of the questions I usually ask when watching or reading something. For instance, I was wondering how there were body parts bursting out of his body that looked like they were just swallowed. How did he manage to take down a leg from the knee to the foot without chewing? The same thing with the other ppl's heads since most of the faces didn't looked chewed on either. You get where I'm going with this? Those details always interest me, so on that alone I want to keep reading. Grivante - Writer of The Zee Brothers : Zombie Exterminators Series and other dark fiction. Stay tuned for updates and more on my various works.